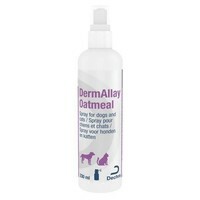 DermAllay Oatmeal Conditioner for Cats and Dogs 230ml is a great way to enhance the quality of your pet’s skin and coat. Using the natural active ingredient, oatmeal, this conditioner works immediately on restoring the coat and moisturising the skin. Also containing natural fragrances, this conditioner leaves your pet looking and smelling beautiful! Use in conjunction with the DermAllay Shampoo for Cats and Dogs, for a better quality skin and coat condition.